﻿Doctor ﻿Strange ﻿has ﻿appeared ﻿in ﻿several ﻿types ﻿of ﻿books ﻿ranging ﻿from ﻿novels ﻿to ﻿adventure ﻿books. ﻿Several ﻿paperback ﻿books ﻿were ﻿released ﻿in ﻿1989 ﻿and ﻿1979. ﻿Some ﻿of ﻿these ﻿books ﻿were ﻿reprinted ﻿comic ﻿books ﻿and ﻿others ﻿were ﻿puzzle ﻿books. ﻿ ﻿In ﻿the ﻿1980s ﻿Marvel ﻿Adventures ﻿books ﻿were ﻿released. ﻿Doctor ﻿Strange ﻿was ﻿featured ﻿in ﻿a ﻿couple ﻿of ﻿them. ﻿These ﻿paperback ﻿books ﻿were ﻿the ﻿adventure ﻿books ﻿where ﻿you ﻿would ﻿read ﻿a ﻿story, ﻿then ﻿pick ﻿what ﻿action ﻿you ﻿wanted ﻿to ﻿take. ﻿Based ﻿on ﻿the ﻿action, ﻿you ﻿would ﻿turn ﻿to ﻿a ﻿certain ﻿page. ﻿I ﻿loved ﻿these ﻿types ﻿of ﻿adventure ﻿books ﻿when ﻿I ﻿was ﻿younger. 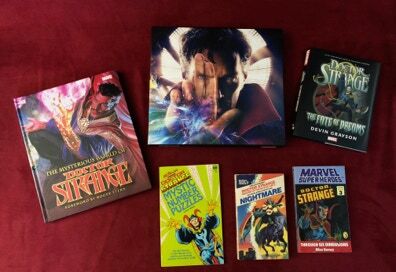 ﻿ ﻿A ﻿slipcased ﻿book ﻿documenting ﻿the ﻿making ﻿of ﻿the ﻿2016 ﻿Doctor ﻿Strange ﻿movie ﻿was ﻿also ﻿released. ﻿This ﻿is ﻿a ﻿great ﻿book, ﻿with ﻿tons ﻿of ﻿great ﻿production ﻿photographs ﻿and ﻿art. ﻿This ﻿page ﻿documents ﻿both ﻿hard ﻿back ﻿and ﻿paperback ﻿Doctor ﻿Strange ﻿related ﻿books. ﻿Graphics ﻿Novels ﻿are ﻿features ﻿on ﻿their ﻿own ﻿page ﻿and ﻿magazines/fanzines ﻿are ﻿features ﻿on ﻿the ﻿Miscellaneous ﻿page ﻿of ﻿the ﻿archive. ﻿Use ﻿the ﻿menu ﻿above ﻿to ﻿navigate ﻿to ﻿other ﻿pages ﻿related ﻿to ﻿those ﻿items.